Is it Friday already? The days seem to fly by! The good thing is that it’s time for a Perfect Picture Book review and craft activity. Susanna Hill’s blog is the place to go to find a whole bunch of other Perfect Picture Book Friday entries. Today’s Perfect Picture Book is a perfect book to read as we celebrate Martin Luther King Day on January 19th. You will need: Red, blue and white construction paper (the white can be a piece of copy paper), scissors, and paste. Fold red paper in half and cut on fold. Paste it on the bottom half of the blue paper. Cut out a star and a thin zig-zaggy larger star-like shape. As I mentioned, time really is flying by and I’m already thinking about the next edition of my newsletter – if you’ve subscribed, you’ll receive it right before Valentine’s Day. If you haven’t subscribed yet, please do: http://eepurl.com/8pglH and grab the free Anti-Bullying Toolkit Guide for Kids. In addition, I’ll enter you in the drawing for a copy of my parent-teacher resource, Show Me How! 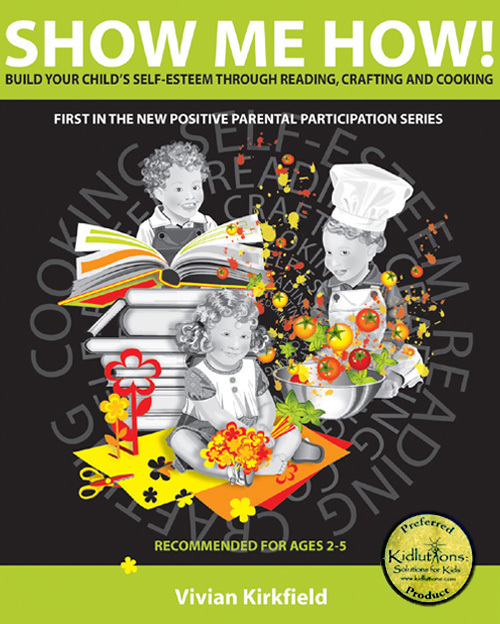 Build Your Child’s Self-Esteem Through Reading, Crafting and Cooking – this is the actual 256pp print copy, not an ebook or Kindle version. It’s filled with themed easy-peasy craft projects and child-friendly recipes, plus 100 picture book summaries and tips on building self-esteem in kids. 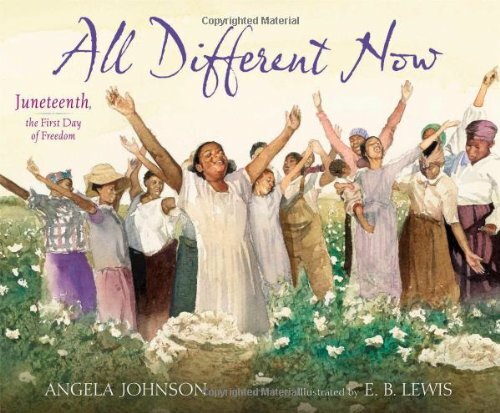 This entry was posted in Craft, Juneteenth, Martin Luther King Day, Perfect Picture Book Friday and tagged All Different Now: Juneteenth, Angela Johnson, E.B. Lewis, Make a Juneteenth Flag Craft, Slavery, the First Day of Freedome by viviankirkfield. Bookmark the permalink. A great book to share any time of the year, but this week is always great. Thanks for sharing it. The flag and all the resources are fabulous. The cover alone shouts, PICK ME! Just spoke with a friend about when the subject of slavery is introduced in school too. Thanks, Vivian. This looks like a book that SINGS!!! Thanks Ms Kirkfield! Thanks for sharing this one, Vivian! I will look for it. It’s hard to talk about slavery and this looks like a good starting point. That is true, Carrie…there are some topics that are just so difficult to approach with young kids. This book is gentle and powerful at the same time…and it captures the joy of the event. I love Henry’s Freedom Box…but that one is somewhat more disturbing for very young kids. I keep seeing this book pop up in reviews. I need to get a copy and read it. My kind of story. I must admit until the book came out I didn’t know their was a celebratory day June 19th. Excellent review. I didn’t know either, Pat. My American history was learned a long time ago, before educators thought it was important for kids to get the whole story. 🙂 Good thing there are wonderful picture books like this one to help us. 🙂 Glad you liked the review…it’s a beautiful book! What a fascinating, powerful and inviting cover, Vivian. I am going to get this book! Thanks for the teaching ideas! This is a wonderful book to read. Not “lecture-y” at all… and yet so full of history.